Spartina alterniflora (cordgrass), a halophyte. A halophyte is a salt-tolerant plant that grows in waters of high salinity, coming into contact with saline water through its roots or by salt spray, such as in saline semi-deserts, mangrove swamps, marshes and sloughs and seashores. These plants do not prefer saline environments but because of their ability to cope with high salinity in various ways they face much less competition in these areas. The word derives from Ancient Greek ἅλας (halas) 'salt' and φυτόν (phyton) 'plant'. 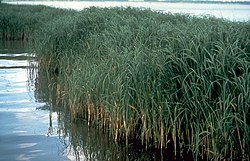 An example of a halophyte is the salt marsh grass Spartina alterniflora (smooth cordgrass). Relatively few plant species are halophytes—perhaps only 2% of all plant species. The large majority of plant species are glycophytes, which are not salt-tolerant and are damaged fairly easily by high salinity. Halophytes can be classified in many ways. According to Stocker (1933), it is mainly of 3 kinds, viz. Again, according to Iversen (1936), these plants are classified with respect to the salinity of the soil on which they grow. One quantitative measure of salt tolerance (halotolerance) is the total dissolved solids in irrigation water that a plant can tolerate. Seawater typically contains 40 grams per litre (g/l) of dissolved salts (mostly sodium chloride). Beans and rice can tolerate about 1–3 g/l, and are considered glycophytes (as are most crop plants). At the other extreme, Salicornia bigelovii (dwarf glasswort) grows well at 70 g/l of dissolved solids, and is a promising halophyte for use as a crop. Plants such as barley (Hordeum vulgare) and the date palm (Phoenix dactylifera) can tolerate about 5 g/l, and can be considered as marginal halophytes. Adaptation to saline environments by halophytes may take the form of salt tolerance or salt avoidance. Plants that avoid the effects of high salt even though they live in a saline environment may be referred to as facultative halophytes rather than 'true', or obligatory, halophytes. For example, a short-lived plant species that completes its reproductive life cycle during periods (such as a rainy season) when the salt concentration is low would be avoiding salt rather than tolerating it. Or a plant species may maintain a 'normal' internal salt concentration by excreting excess salts through its leaves, by way of a hydathode, or by concentrating salts in leaves that later die and drop off. In an effort to improve agricultural production in regions where crops are exposed to salinity, research is focused on improving understanding of the various mechanisms whereby plants respond to salinity stress, so that more robust crop halophytes may be developed. Adaptive responses to salinity stress have been identified at molecular, cellular, metabolic, and physiological levels. Some halophytes are being studied for use as "3rd-generation" biofuel precursors. Halophytes such as Salicornia bigelovii can be grown in harsh environments and typically do not compete with food crops for resources, making them promising sources of biodiesel or bioalcohol. The amount of freshwater resources are steadily decreasing over long periods of time. This has led to the act of harvesting halophytes in seawater in order not to alter the biomass and seed yield of the plant. This procedure has helped halophytes to be viewed as viable candidates for bio-energy crops. The main factors that make halophytes more viable for biofuel production are the oil made from the seed and the lignocellulosic biomass of the halophyte. ^ a b Glenn, E. P.; et al. (1999). "Salt tolerance and crop potential of halophytes". Critical Review in Plant Sciences. 18 (2): 227–55. doi:10.1080/07352689991309207. ^ "Halophytes: Classification and Characters of Halophytes". ^ Glenn, E. P.; Brown, J. J.; O'Leary, J. W. (1998). "Irrigating Crops with Seawater", Scientific American, Vol. 279, no. 8, Aug. 1998, pp. 56-61. ^ Gupta, Bhaskar; Huang, Bingru (3 April 2014). "Mechanism of Salinity Tolerance in Plants: Physiological, Biochemical, and Molecular Characterization". International Journal of Genomics. doi:10.1155/2014/701596. PMC 3996477. Retrieved 15 October 2015. ^ "Fact Sheet: Alternative Fuels". IATA. December 2013. Archived from the original on 2014-02-01. Retrieved 2014-01-28. ^ Glenn, Edward P.; Brown, J. Jed; O'Leary, James W. (August 1998). "Irrigating Crops with Seawater" (PDF). Scientific American. USA: Scientific American, Inc. (August 1998): 76–81 . Retrieved 2008-11-17. ^ Sharma, Rita; Wungrampha, Silas; Singh, Vinay; Pareek, Ashwani; Sharma, Manoj K. (2016-09-13). "Halophytes As Bioenergy Crops". Frontiers in Plant Science. 7. doi:10.3389/fpls.2016.01372. ISSN 1664-462X. PMC 5020079. PMID 27679645. ^ Debez, Ahmed; Belghith, Ikram; Friesen, Jan; Montzka, Carsten; Elleuche, Skander (2017-09-01). "Facing the challenge of sustainable bioenergy production: Could halophytes be part of the solution?". Journal of Biological Engineering. 11. doi:10.1186/s13036-017-0069-0. ISSN 1754-1611. PMC 5580303. PMID 28883890.